Midnyte Reader: If I Stay. 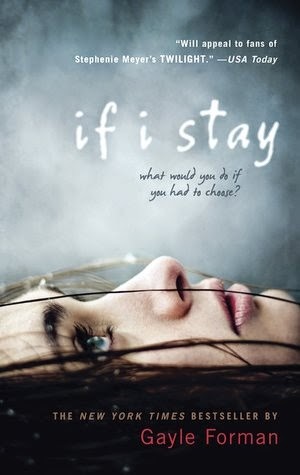 Title/Author: If I Stay by Gayle Forman. Synopsis: On a day that started like any other, Mia had everything: a loving family, a gorgeous, admiring boyfriend, and a bright future full of music and full of choices. In an instant, almost all of that is taken from her. Caught between life and death, between a happy past and an unknowable future, Mia spends one critical day contemplating the only decision she has left. It is the most important decision she'll ever make. Midnyte Musings: Warning: This review contains some spoilers! Wow. Just wow. And all the other cliches, like squee, OMG and add some emo gifs too. I've had this book for years and yes, I've heard how amazing it was and how wonderful and how OMG it was. But you know, contemporary is not truly my thing so there it sat on my TBR shelf. Until I saw the trailer for the movie. One scene in particular moved me, when the grandfather told her that she still had family. Aw geez, kill me now. I read this book in two days. Two. Me. Yes, me. The one who takes so long to read. Once I picked it up, it was very hard to put down. Yeah, it is heartbreaking yet so worth reading. This story is told by Mia in first person and her voice has a wonderful, easy flow. The reader gets to know her through a series of flashbacks and we meet her family, her best friend and her boyfriend. She is basically an open book without a lot of angst. I loved that Mia had such supportive parents. Parents that are cool and hip and that she gets along with. I love that she has a younger brother she adores and that she is really a happy, well adjusted teen. Her boyfriend Adam is an up and coming musician in the punk rock scene and I can see why he is so many people's book boyfriend. Charming and smart and pretty much irresistable. I love how Mia and Adam go through their rocky phases and their tiffs because of their different interests and personalities. It's not all soda pop and roses, which makes them and their relationship all the more real. Mia is caught in a kind of limbo where she is not dead, yet she is not in her comatose body either. She is now relegated to observing those around her and their reactions to her accident. She learns she loses her parents and then she loses her younger brother. She is devastated and wonders how she will be able to deal with the grief if she does wake up. One nurse told her family members that the decision is up to her, not the doctors and not modern medicine. One thing though that Mia has issues with is the feeling of her belonging and now that her her immediate family is gone, those fears are prominent. She doesn't know how she can go on without them and she doesn't want to be "the girl who survived." How will she cope? She realizes with the help of a very smart nurse, that whether she decides to fight and come out of her coma or whether she releases herself and passes on, is her choice. The choice is not obvious, at least not to her. What would you do in such a situation? The writing is just gorgeous. And not only that, it is smart and insightful. The two observations I absolutely love are "Seventeen is an inconvenient time to be in love, along with the idea that a person is everything they have, even what they have lost. I'm not one to read everything that everyone else has read, but I found If I Stay to be touching and captivating. Starstruck Over: This is pretty much a perfect book. Labels: If I Stay, YA. "I read this book in two days." lol I'm so glad you loved it though. It was REALLY good! It was kind of this simple story - no gimmicks and all the better for it. I will never forget picking this book up at Barnes and Noble when it came out, reading the first few chapters, bursting into tears, and having to rush through the checkout and out of the store. It's such a moving book!! Loved your review Pam! It was insightful and your thoughts were spot on to how I felt when I first read this book. I absolutely loved this book and I have been thinking of picking it up again to reread. It was such an incredible read to me. I absolutely want to reread prior to seeing the movie. Do you think you'll read Where She Went? It's good, but not as good (to me at least).